Autumn Beauty boasts spectacular blooms ranging from yellow to deep burgundy. 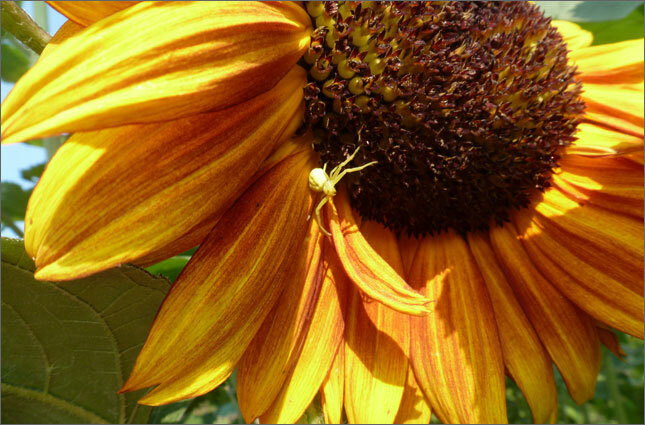 Sunflowers originated in North America where they were an important source of nutrients for First Nations populations. The sunflower is actually the oft-forgotten pretty fourth sister in a three sister planting. Sow seed 2 cm (3/4 in) deep in spring - they will know when to come up. Thin sunflower plants to 30 cm (12 in) apart - or more. They can reach 2 m (6 ft) or higher and may require support. We usually plant them on the north side or along the north perimeter of a garden. The bright colours enrich any garden. Sunflowers rich pollen is highly sought after by numerous pollinators. The edible, ripening seeds are a favourite of hungry birds in the fall. The presence of birds and squirrels in a sunflower patch are an indicator that the seeds are ripening. Both critters will eat all of your sunflower seeds if they can. So we cut most of the mature heads and dry them in a safe place once the head starts getting nibbled. For drying, we spread the heads out on screens or hang them from the ceiling to encourage airflow and discourage mold.